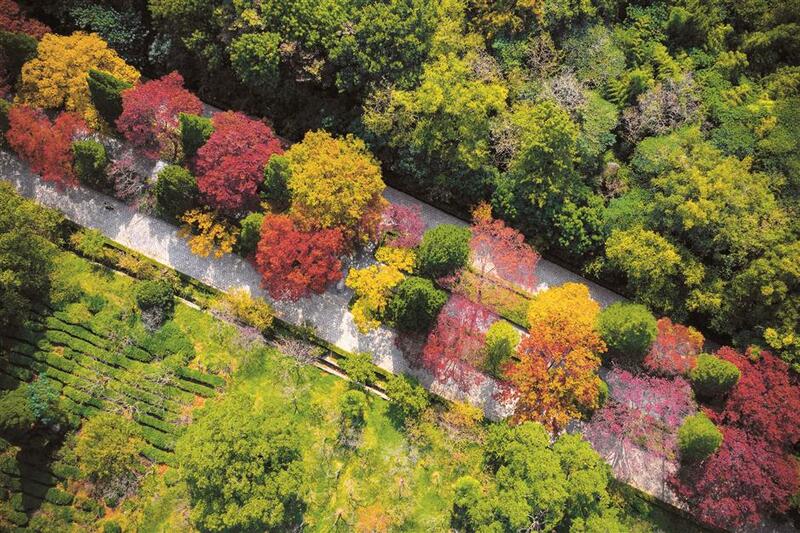 Purple Mountain in Nanjing holds imperial tombs, temples and an elegant palace. Set amid natural beauty, this UNESCO heritage site is both solemn and inspiring. PURPLE Mountain in the Jiangsu Province capital of Nanjing has been an auspicious site for millennia. Its history dates back to AD 229, when the city became the capital city during the reign of the Kingdom of Wu (AD 222-280). Six subsequent dynasties also chose it as their capital, and all of them left their marks on the mountain. Most of the relics on the mountain are tombs of ancient emperors and their loyal officials, reflecting the good fengshui of the site. There are also temples, Dr Sun Yat-sen’s Mausoleum and an observatory more than 80 years old. It might not be the best idea to visit the place in the deep winter, but I braved the weather to visit the site on a chilly day. Battery carts shuttling between the relics saved a lot of time and made the trip warmer. In a day’s travel, one traverses 1,000 years of history. Of all the relics on Purple Mountain, the Xiaoling Mausoleum of the Ming Dynasty (1368-1644) occupies a special position. It was a pioneer in royal mausoleum design during the Ming and Qing (1644-1911) dynasties. The mausoleum, along with tombs of several high-ranking Ming officials, was designated a UNESCO National Heritage Site in 2003. Xiaoling Mausoleum is the tomb of Zhu Yuanzhang, founding emperor of the Ming Dynasty. The mausoleum was built for Zhu Yuanzhang (1328-98), founding emperor of the Ming Dynasty, and his wife Empress Ma. Construction on the mausoleum took 25 years and the labor of more than 100,000 soldiers and workmen. According to historical records, construction started one year before Empress Ma’s death. The mausoleum occupied a large area that includes more than 70 ancient temples. Most of them were lost in disasters or wars. 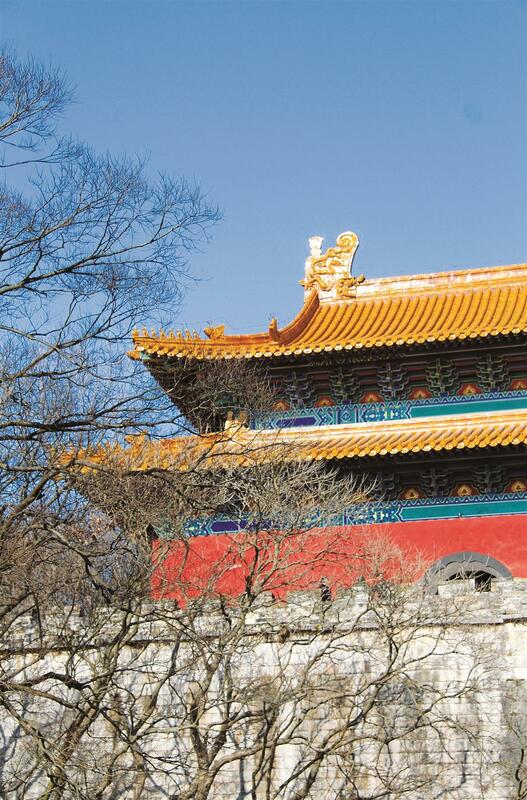 Just like the Ming tombs in Beijing, visitors need to walk along a Sacred Path to reach the mausoleum. The starting point of the path is at the Xiama Archway, where ancient military officials were ordered to dismount from horseback and walk the 2.26-kilometer distance to the mausoleum to pay homage. Not far from Xiamafang Station on Metro Line 3, the area around the archway has now been converted into Xiamafang Relics Park. It is recorded that the Xiaoling Guardians, an elite squad of the Ming Dynasty, were stationed there to protect the gravesite. The remains of ancient barracks and inscribed stone steles warning visitors to behave can still be seen in the park. 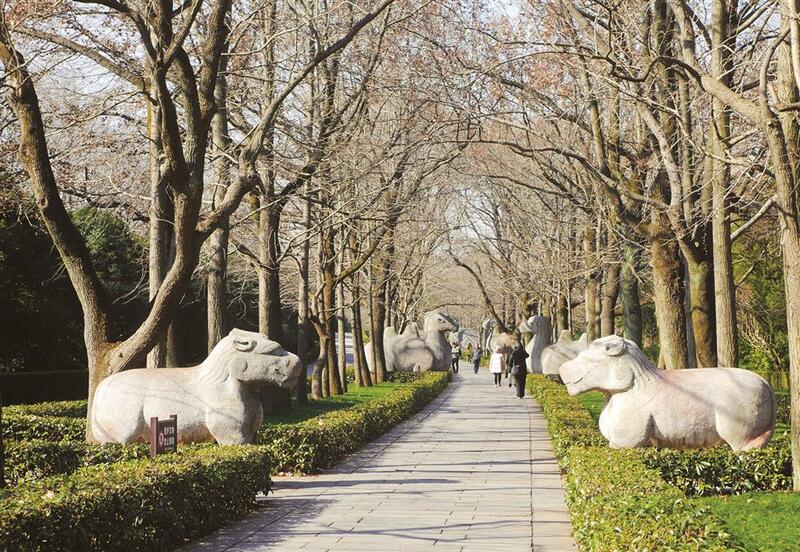 The path is flanked by stone sculptures of animals, mythical creatures and official figures. The sculptures symbolize the majesty of the emperor and the loyalty of his officials. The sculptures are said to be among the highest artistic achievements of the early Ming Dynasty, but many have been weathered by time. The scales of dragons and the faces of some officials are hardly recognizable today. Sculptured mythical creatures guard the path to an emperor’s mausoleum. An old lady surnamed Hua, who lives in Nanjing, walked with me along the Sacred Path, curious as to why I chose to visit in winter. “Now that you mention it, I do regret my choice,” I replied half-heartedly. Hua told me people don’t venerate the emperor anymore, and they do find the path an ideal place to jog. After parting ways with Hua, I saw the main buildings of the mausoleum begin to reveal themselves at the end of the path. Walking through several gates, the first main building is Xiangdian Hall, where the emperor and the empress were worshipped. The hall was supposed to serve the same function as Ling’en Hall in Changling in Beijing, where Emperor Yongle (1360-1424) was worshipped in his mausoleum. But to my disappointment, Xiangdian is way smaller and much plainer-looking than Ling’en. It is even much smaller than most main halls in Buddhist temples. The hall was nearly destroyed during the Taiping Rebellion in the mid-19th century. The structure was rebuilt years after the war but never restored to its original look. What a pity! Another relic damaged in the same war is a stone stele inscribed by Emperor Kangxi (1654-1722) of the Qing Dynasty. Fortunately, Qing officials managed to retrieve the broken pieces and glued them back together. Today the restored stele still stands tall in the mausoleum, where Emperor Kangxi praised Zhu’s sovereignty to be “as outstanding as the Tang Dynasty (AD 618-907) and Song Dynasty (AD 960-1279).” A conspicuous crack can be seen right below the character for tang. Although the epigraph might have been a guidepost for graverobbers and archaeologists, a recent probe shows that the crypt was never opened. The winding underground path toward the crypt apparently fended off all potential intruders. Compared with Emperor Wanli (1563-1620), whose tomb in Beijing was repeatedly robbed and explored, and whose remains had been lost, the founding Ming emperor suffered no such indignities. Direct high-speed trains link Shanghai and Nanjing. Metro Line 3 in Nanjing extends to the mausoleum. Visitors can either alight at Xiamafang Station and walk the entire Sacred Path, or at Muxuyuan Station, which is closer to the main site of the mausoleum. Visitors to Mausoleum of Sun Yat-sen (1866-1925), the founding father of modern China, never forget the very long staircase leading up to the main building of the gravesite. The 392 stairs are built into a cliff on Purple Mountain. It was Sun’s idea to be buried in Nanjing, His wife Soong Ching Ling (1893-1981) and eldest son Sun Fo (1891-1973) chose the exact location. The construction of the grand mausoleum took five years. The main building of the mausoleum is mainly in Chinese style, with Western elements. On the ceil­ing of the worshipping hall is the mosaic pattern of a “blue sky with a white sun,” the symbol of the Kuomintang flag. The original pattern, along with the stele inscription of in the mausoleum, were shoveled away during the “cultural revolution” (1966-76) but restored in 1981. The tomb of Sun Quan (AD 182-252), the first em­peror who designated Nanjing as a capital city, looks shabby compared with the other grand mausoleums on Purple Mountain. In fact, just a few years ago, the tomb was just a lump on the ground with no gravestones. Historical records show that the emperor of the Kingdom of Wu and his two empresses were buried on Plum Hill, which is part of Purple Mountain. A probe in 2003 discovered a wide underground space with artificial pathways on the hill. The size of the crypt indicated that it could be the tomb of an ancient emperor. 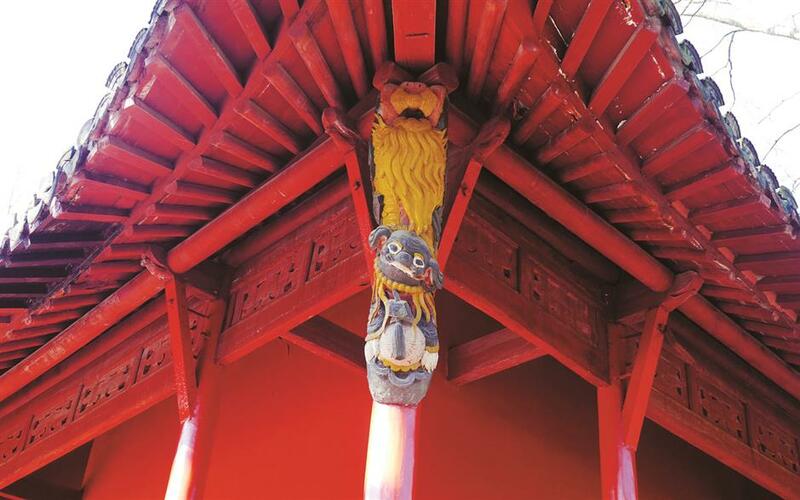 The location not only coincided with historical records but also with Nanjing local folklore. It is said that when Zhu Yuanzhang ordered the construction of the Xiaoling Mausoleum, officials suggested he relocate Sun’s tomb, but the emperor refused, saying he wanted Sun to “watch over the grave for me.” The location of the crypt faces right to the gate of the mausoleum, seemingly verifying the story. Today a stone bridge and a statue of Sun near the tomb try to rectify the past by giving a powerful king who once ruled regions south of the Yangtze River a proper commemoration after his final resting place was so long forgotten. 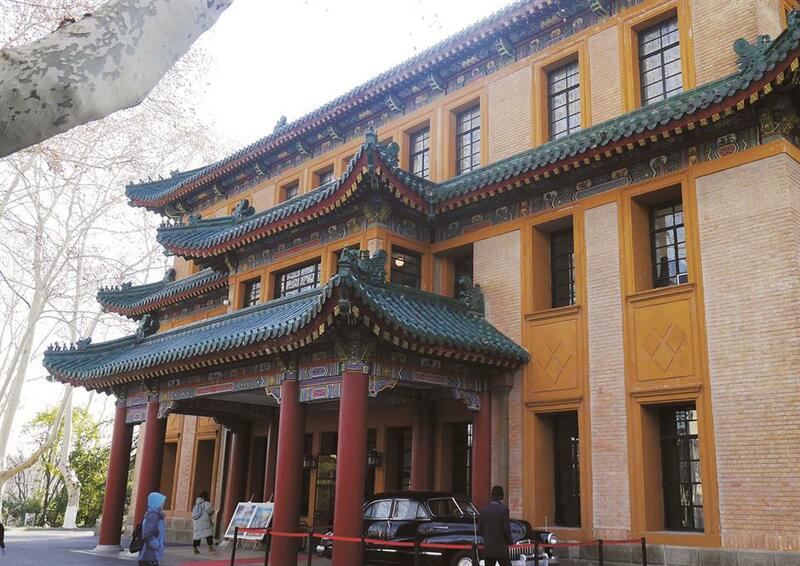 With Chinese-style decor outside and Western decor inside, the mansion was the official residence of for­mer Kuomintang chief Chiang Kai-shek (1887-1975) and his wife Soong Mei-ling (1897-2003). Before it was opened to the public in 1984, the do­mestic furnishings and decor were restored to their original look when the couple often stayed there in the 1940s. Inside are two bedrooms, a grand banquet hall and a private Christian chapel where the couple prayed and attended services with friends. The underground floor, where the servants and guards were once housed, has been partly modified into a gallery displaying Soong’s traditional Chinese paintings. The current management of the site praises Chiang as “handsome and unrestrained,” and Soong as “young and beautiful,” which shows changing at­titudes toward the couple in recent years.